If you select one or more cells in Google Spreadsheets, you'll see a new option in the context menu: "Change format with rules". You can change the color of the text or the background of a cell if that cell verifies one or more rules. Google Spreadsheets lets you format the cells that contain a specific text, a date or have a value in a certain range. Other spreadsheet apps, like Microsoft Excel 2007, have more advanced options like showing gradient colors for the values, highlighting the top x% values, finding duplicate values or defining a rule based on a custom formula. The second new feature lets you hide rows and columns that shouldn't be displayed all the time. Select the column or the row, right-click and choose "Hide column (row)". To make it visible again, click on the small rectangle that replaces the column or the row. Google also improved printing by converting the spreadsheet to PDF and printing that output. There's also a new function that provides an alternative output in case an expression cannot be evaluated: =IFERROR(0/0, "Undefined") displays "Undefined" instead of an error. Google Spreadsheets seems to evolve much faster that Google's word processor and there aren't too many important missing features. What would you like to see in the next iterations of the product? i find Conditional Formatting very useless. does anyone use it 4 real? Its incredibly useful to see negative/positive values quickly without having to read the figure (lazy, I know). Conditional formatting makes it easy to highlight specific values from a column or row. Let's say you have a report that shows aggregated data about your website's traffic. You may want to highlight the days when your website had more than 30,000 visitors and see if there's a pattern. You can apply it whatever you want, you simply have to select what you want the formatting to apply to. if you want to apply it to the whole thing, select the entire document first. Data filters! I know this feature has been worked on and there's a solution out there but it would be nice if it were actually in the spreadsheets. It's a very cool. I'm waiting for sum of hour greater than 23:59. Spreadsheets are a great way to manage invoices, but without being able to add in your logo it's kind of a bummer. Also, I wish they didn't force you to print all of the grey lines that make up the cells. Google Docs introduced new few features but Right Click options are still not working. Google has to eliminate this problem from Google Docs. would be the criteria to change the background color to a light gray. Pretty, pretty please??? Autocomplete. I want to start typing in a cell and have autocomplete from other cells in the column. Helps a lot for my checking account register. I was super excited about the conditional formatting until I tried to use. It's been said by others here but I'll reiterate that the conditions need to be more specific. I have a list of wedding guests and I would like to have the names of the wedding guests that aren't showing up be grayed out. I have a column for that so it should be easy but all i can do is color the 1/0. Highlighting another cell or simply the entire row would be far more useful than it's current implementation. Probably the best way would be to define custom formulas and have an option for highlighting the entire row. #1 on my list for basic usability is being able to freeze columns as you can rows. I need badly to block formula cells from being edited by clueless users. Yes basic usability certainly includes the possibility to freeze columns. do you know a way, how when a user fills in a cell with a color, this leads to another cell displaying true or false? Conditional formatting is hugely helpful. I only hope they can quickly add to this. Because right now only being able to change the cell with the conditional data is very limiting. I would at least like to be able to specify a range of cells that are affected by the contents of another range of cells. But at least we have something. Better than nothing right now. Please upgrade Google Doc Soon. Like If Cell A6 has text value 'PAID' then A4 baground color will green, if A6 is NULL then A4 will have RED baground color etc etc. How do you people think the idea ? This Conditional formatting rules is applicable for only selected cell only, what can i do if i apply for other cell. Would be nice to have the possibility to alternate the background colors. I only use conditional formatting when I need ANOTHER cell to change formatting when a value is changed in the selected cell. I would like this soon. If you're going to add "Cell is Empty" how do you not add "Cell is not Empty"
PLEASE OFFER ABILITY TO LOCK EDITING BY EVERYONE EXCEPT ADMIN!!!!!!!!!!!!!!!!!!!!!!!!!!!!!!!!!!! I can't do this today without the more complex formulas. I would really like google spreadsheets to have to allow little bit more complex conditional formatting rules. For example to be able to set background of cell A12 depending on value of cell B12. Another request for conditional formatting that allows for references to other cells and formulas. This has been requested for almost two years! I'd like to eliminate Excel but I can't because of the severe limitations inherent in Google's design. 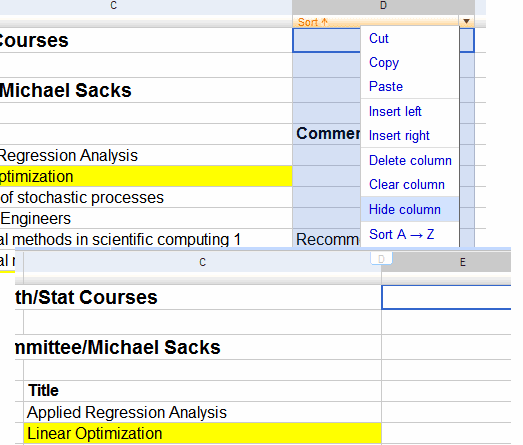 Like to add my ++ to the need for support for formulas in conditional formatting. It makes finding errors so much easier when working with financial info and probably many other types of data too! I would like Pivot Tables! We need a feature where an entire row / column can be highlighted based on a single cell's value within that row / column. And we use conditional cell formatting all the time. Works great! Great features, I would really like google spreadsheets to have to allow little bit more complex conditional formatting rules. Need ability to change color of single words, or underline single words in a cell full of text. Would be useful because many flashcard study programs use google docs spreadsheet. Although formating individual cells, it would be massively more useful to be able to format a range of cells based on a formula,ie shading an entire row based on an IF statement. This functionality is available in Excel, StarOffice Calc etc. This is a case of programmers saying "WOW, LOOK WHAT OUR PRODUCT CAN DO!" instead of "WOW, OUR PRODUCT IS EXTREMELY LACKING COMPARED TO ANY OTHER SPREADSHEET PROGRAM." In reality Google Spreadsheet is extremely lame and half done compared to Excel and any other non browser based program. In addition the only formatting that can be done is to change the text color or the cell background color. This too is extremely lacking. Compare it with Excel. The goal of Google Docs should not be to just provide a neat browser based spreadsheet program. It should be to create a better spreadsheet program than Excel which just happens to be browser or web based. At this point it is completely out of the question to use Google Docs for anything other than simple data entry and tracking. to find a cell that's not empty, how about this: "cell is greater than -1". This allowed me to format only cells in my case that had a value in them, and that was greater than or equal to 0. It worked a treat, left all my blank cells alone, and only coloured the ones I was interested in. I wish there was an easy way to find duplicates...can anybody shed some light? yes, formatting based on another cell value would be great. Data filtering please, - urgently needed! where the values are dates. first of all I would like to have condition formatting where the whole row or a range of cells gets highlighted based on a cell value. This is incredibly useful in tracking tasks where the current date > completion date etc. or if the job is completed, turn the range of cells in a list green. Also, is there a way to see the blog discussion with the latest discussion posts first and the oldest at the bottom ? I would like to second this request for whole row conditional formatting based on the contents of a single cell in that row. Being able to format a whole range of columns with conditional formatting is indeed sorely needed. data filtering, and custom based IF statements for conditional formatting please. Far too limited to be used for what I require it for. Makes a mockery of you providing our companies gmail and docs when it cant provide the level of services we are all used to from Microsoft. Find a way to let us add Microsoft Excel to your docs and we have a winner! I have been using Excel Conditional Formatting to track expiration dates, I was so excited to put these on Google Docs so that my boss could see the spreadsheets as I worked on them when he is working out of the office. I knew this was too good to be true---I lose the conditional formatting. If I download to Excel I can set up the conditional formatting I need to check on expiration dates, but I lose it when I close and have to redo each time I want to check. What a huge pain....PLEASE some write script for conditional formatting. I want to color a cel as a part of a pivot -- so I can display more information per cel. Really, this is because I'm reading "How Google Tests Code" and want to make a test plan spreadsheet that works the way they do in the book, with number of tests as a number and the risk as the background color of the cel. I would like to be able to protect any cell that one of the users has entered data into. I have people wiping out each other's entries.